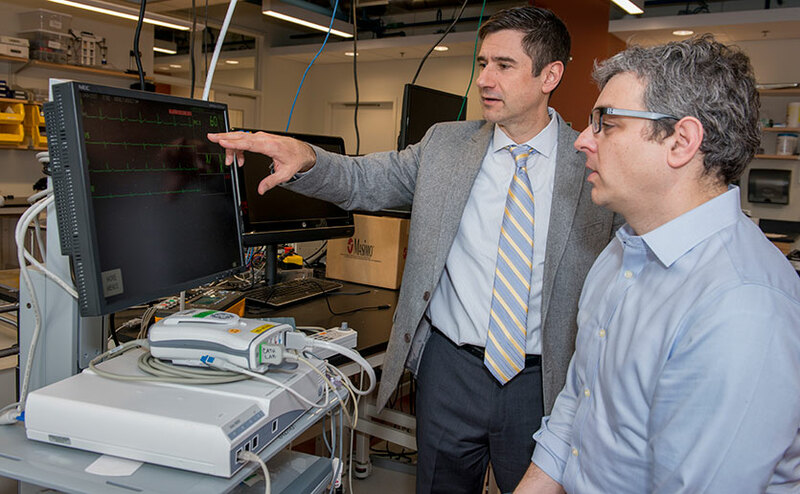 Mass General's Michael Filbin, MD (left), and MIT's Thomas Heldt, PhD, received an MGH-MIT Grand Challenge grant to develop a sepsis warning system. An MGH-MIT collaborative project to better diagnose deadly sepsis is one of the successes of a strategic partnership between the two institutions. Massachusetts General Hospital clinicians and a Massachusetts Institute of Technology biomedical engineering team are developing a computer-based early warning system to alert clinicians when a patient might have a deadly condition called sepsis. Collaborators (from left) Thomas Heldt, PhD, Michael Filbin, MD, and Andrew Reisner, MD. The project is the result of a joint research partnership launched by Mass General and MIT three years ago. Its success to-date reflects the unique collaboration opportunities available to Mass General because of its proximity to other leading research institutions in the Boston-Cambridge area. Other successful examples of such collaboration include Mass General’s involvement in the Ragon Institute of MGH, MIT and Harvard, which focuses on the discovery of an HIV/AIDS vaccine and the broader study of immunology. They’ve been able to shorten by half the time it takes clinicians to start patients with sepsis on lifesaving antibiotics. If not recognized and treated early, sepsis can lead to septic shock and total organ failure. “If we can identify these patients earlier, we can possibly save lives,” Dr. Filbin says. The best chance of detecting sepsis early is to analyze and learn from massive amounts of data from thousands of patients. Mass General has a wealth of such data. But it needs to be integrated and sifted through. That’s where collaboration with Thomas Heldt, PhD, has been key. Dr. Heldt is MIT’s W.M. Keck Career Development Professor in Biomedical Engineering. He’s an expert in mathematical modeling and leveraging big data for clinical use. The collaborators’ preliminary analysis, “found that the vast majority of patients who go on to have septic shock have other risk factors, such as diabetes or they’re elderly or their immune system is compromised,” Dr. Filbin says. They also found other early clues, such as elevated heart rate and mildly low blood pressure. From these analyses, the team developed a simple rule that identifies patients with possible sepsis. Those patients should be given fluids and considered for treatment with antibiotics. Used in the Mass General Emergency Department, the rule shortened by half the time it took clinicians to start patients with sepsis on lifesaving antibiotics. The goal is to fully computerize the warning system. It will flag sepsis in real time by integrating and interpreting all patient information as it comes in from their bedside monitors, lab tests, imaging tests and past medical history. Drs. Filbin, Reisner, and Heldt’s sepsis project was seeded with funding from an MGH-MIT Strategic Partnership Grand Challenge grant. Recognizing the potential for transformative advances by partnering engineers with clinicians, the leaders of Mass General and MIT formalized a partnership almost three years ago. The Filbin/Heldt project was one of eight funded as part of a grand challenge to improve the speed and accuracy of diagnosing diseases. Another grand challenge focuses on the neurosciences. Each project has a Mass General and an MIT collaborator. “The progress has been phenomenal,” says David Louis, MD, chief of Pathology at Mass General and co-leader of the diagnostics grand challenge. The collaborations have resulted in published journal articles and most have secured additional funding to continue their projects. “These collaborations are beginning to show results toward our goal of transforming diagnostics,” adds his co-leader Charles Sodini, PhD, the MIT LeBel Professor of Electrical Engineering. Dr. Sodini’s own electronics research includes developing tiny, wearable devices, such as for diagnosing heart problems. He points out that in the past, MIT engineers didn’t seek clinicians’ input on such technology until they were satisfied that it worked. Then the problem became finding an application for the new technology. Another project centers on an innovative wireless technology that can “see” motion in another room. It was devised by MIT’s Dina Katabi, PhD, the Andrew and Erna Viterbi Professor. An obvious application would be in security. But through the Grand Challenge, she found her collaborator, Matt Bianchi, MD, PhD, chief of Mass General’s Division of Sleep Medicine. They have adapted her technology to monitor patients with possible sleep apnea, disruptions of breathing during sleep. Recognizing the many other potential clinical applications of Dr. Katabi’s wireless technology, others at Mass General are excited about collaborating with her as well. “These successes are just what we had in mind by exposing the MIT and Mass General research communities to new people and ideas,” Dr. Louis says. Funding for the diagnostics grand challenge runs out at the end of 2017. Please contact us for more information on how to help ensure it continues to kick-start other promising innovations. The Massachusetts General Hospital Research Institute is the largest hospital-based research program in the United States, with a community of over 8,000 people working across more than 30 institutes, centers and departments.